The alphabetical list of passers for Region 10 (Northern Mindanao) April 2016 Civil Service Exam - Paper and Pencil Test (CSE-PPT) is now available online. 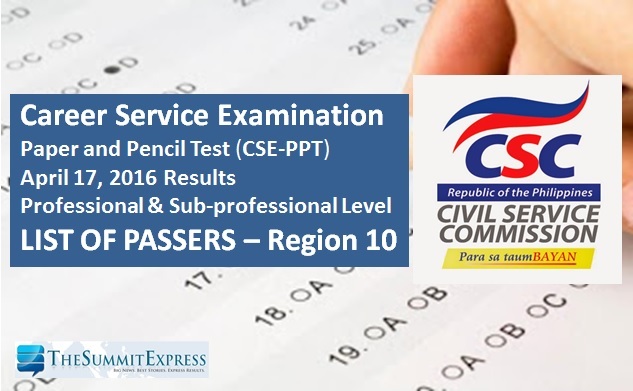 The Civil Service Commission(CSC) on Thursday, May 26, announced that 1,157 passed the professional level exam on these areas: Bukidnon, Camiguin, Lanao del Norte, Misamis Occidental and Misamis Oriental. Here's the full list of successful examinees for Region 10 civil service exam (CSE-PPT) professional and sub-professional levels.